We’d heard about Bub City’s brunch from several food lovers. And after sampling Bub’s bloody at the Chicago’s Bloody Mary Competition, we had no choice by to give it a try. To be honest, we expected that walking into Bub City would be like walking onto the set of Coyote Ugly (or the cheesy bar that used to be in River North. Anyone?). Sure it is a Nashville-themed country bar, but the kitsch was kept to a tasteful level. 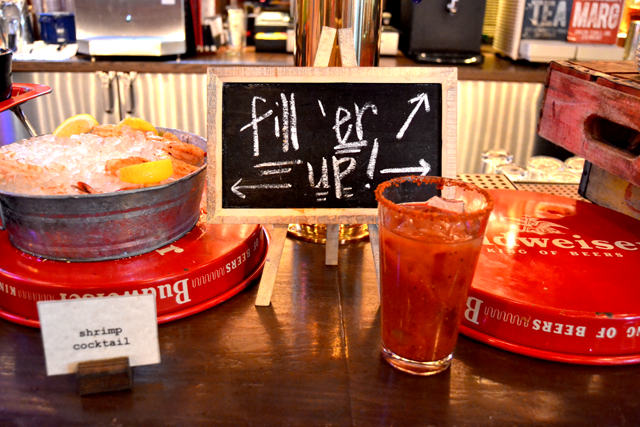 Bub City does a mean bloody mary bar. And while bloody mary bars can be crazy overwhelming, Bub City keeps it simple, even giving you directions along the way. First, start with the rim and the booze. With three rimmers to pick from, we decided the Bub Rim made the most sense. It’s BBQ place, so the rubs must be good, right? You can choose from vodka, tequila, rye or bourbon, so one of us picked rye while the other went with tequila. With your booze chosen, next you do as the sign says, “Fill ‘er up.” There are a few mixes from which to choose, but we opted for Bub’s house mix. When in Bub. 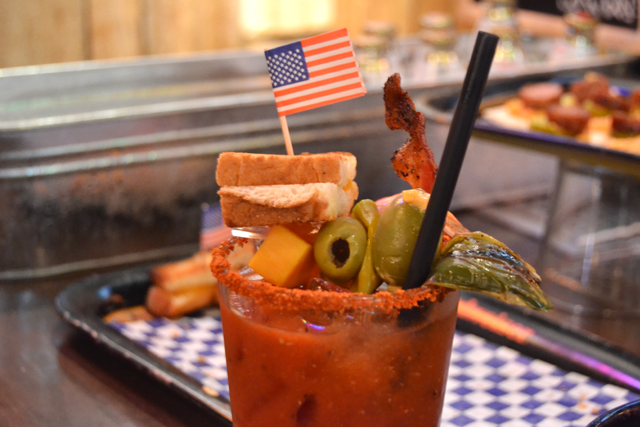 Finally, it’s time to dress up your bloody mary. There’s a plethora of spices and sauces you can add, and the garnishes are incredible. We love the roasted peppers, shrimp, pimento cheese-stuffed olives and mini grilled cheeses. 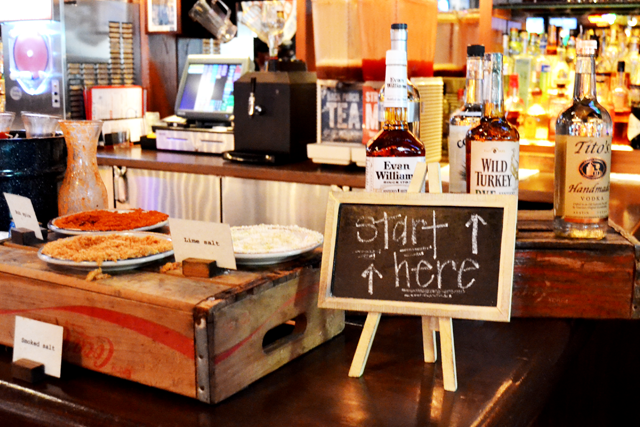 Pro tip: be sure to grab a saltine with pimento cheese and sausage at the end of the bar. 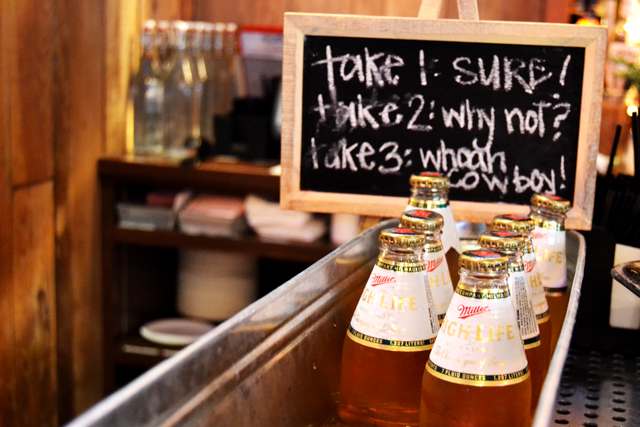 Finally, grab a pony or two of High Life and enjoy. 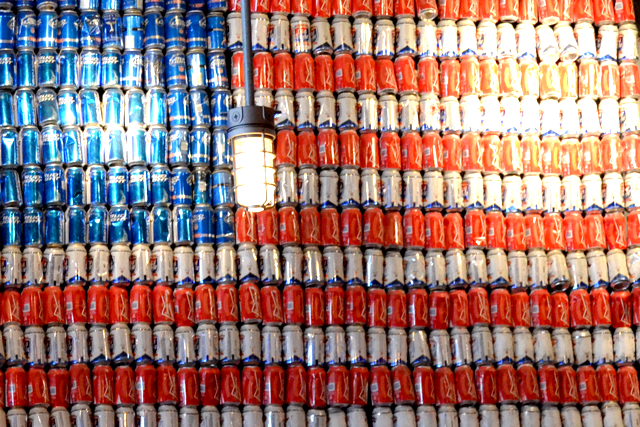 We really like this one, you guys. Smoky, flavorful and all around solid. We believe the word that came up was “legit.” What makes this one stand out are the smokiness of the house mix (which comes in part from the BBQ rub spices) and the taste of cumin. We loved the food, too. 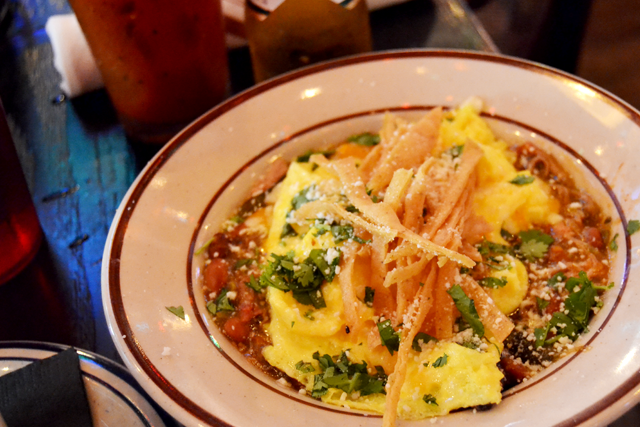 Particularly the Green Chili Scrambler, which is kind of like a stew meets chilaquiles. In a really good way. It’s flavorful thanks to the green chili, cilantro and savory pork carnitas and lacks the sogginess factor of chilaquiles. 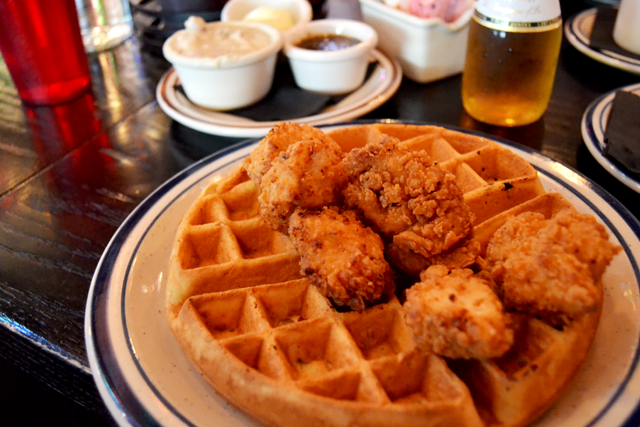 Also, the Fried Chicken and Waffle. As Elaine says, “Wut.” Both perfectly crispy, which can be changed with the bacon-jalapeno honey or country-style gravy. We can’t wait to go back for the BBQ.